Well, now I feel right fancy that I knit up my first stripes this past week. Definitely not as difficult as I had made it in my head. I'm looking forward to doing something with even more colors and seeing if I can keep all the skeins straight as I knit. And like with most other things I knit, I probably didn't do it exactly correct, but I'm not sure anyone would ever know. I used this Baby Pixy Hat pattern and soft wool. I have a doula client due any day with what we think is a boy. But just in case last night I cast (casted?) on for another newborn hat in a more feminine heathered lavender shade using Ginny's pattern (again). Always so fun waiting for a babe to make their entrance! In the background there is the sweater I began that will never come to fruition. See, when I knit things I don't really calculate how much yarn it's going to use. (Because I'm lazy.) And sweaters? They take a lot of yarn. When the yarn you choose is $15 a skein and you realize that about six inches of the sweater took up a full skein, you are a smarty pants and realize that if you finish said sweater, it would cost more than your wedding dress and your most expensive shoes and pretty much any other item in your wardrobe combined. And then you realize that probably isn't the most prudent decision in the world. And most likely ten minutes after finishing it it probably would've been spilled upon or snagged anyway. But that sweater I had in my head sure would've looked cute. I now realize why hand knit clothes, especially those made with quality yarn, are so pricey. Back to Goodwill I must return. I just started Ree Drummond's From Black Heels to Tractor Wheels. It's an easy cute read so far. I'm excited that I have a few books queued up for when I finish this one. Yesterday I opened up The Peterkin Papers with the boys and read a few chapters with them. I bought this at a school closing sale and it's one of the ones we've been meaning to get to. These frigid cold days are perfect for snuggling up with a few little boys and a book, I think. Also a cute read and has a certain style that is a bit hard to wordy to read aloud but we'll keep at it anyway. I'm also determined to keep reading lists this year marking the books John Paul reads, I read, and those we read aloud as a group. I printed out an easy template to fill in as we go and I hope we can be disciplined enough to take the measly few seconds to write things down as we read to have as a record. 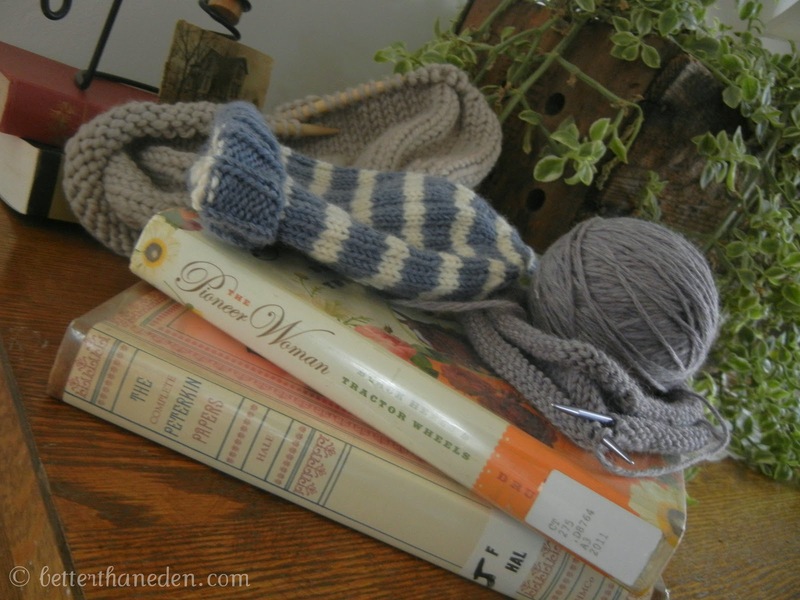 What are you knitting or reading or creating these days? Pop over to Ginny's to see more! Have a wonderful Wednesday! Oh, and edited to add: Click on over to Bonnie's to nominate your favorite Catholic bloggers for the first annual Sheenazing Awards!! I think you might be more sensible than me in that I buy all the yarn needed and don't always complete the project. Love the title of the book 'Black Heels to Tractor Wheels'. Thanks for sharing. I read that book (Black Heels to Tractor Wheels) last year. It was cute. It made me want to write out Kevin and I's story (but I haven't). I found a reading list printout at Life Your Way that I use to track each girls' reading and what we read aloud. Personally, I keep track of my books in a journal - I've been writing them down for 11 years now! But I also keep track on goodreads and find that to be helpful. There is even an app for it! Knitting - nothing, Reading - blogs, Creating - a budget at work. Pretty interesting stuff, huh?